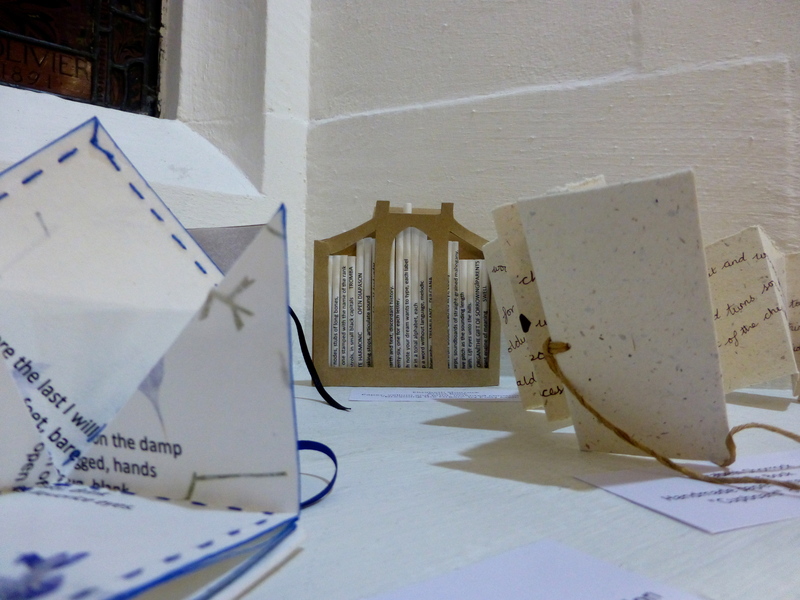 Holy Detritus was a collaborative project between the Lakes Collective (a group of Cumbria-based artists and makers) and ten Lancashire- or Cumbria-based poets. 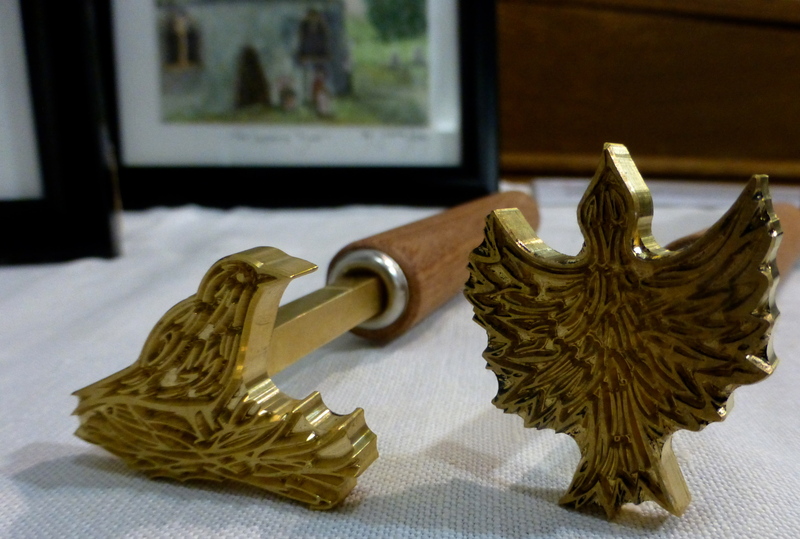 The poets responded to the church of St. Oswald’s in Grasmere. The Lakes Collective responded to the poet’s responses. 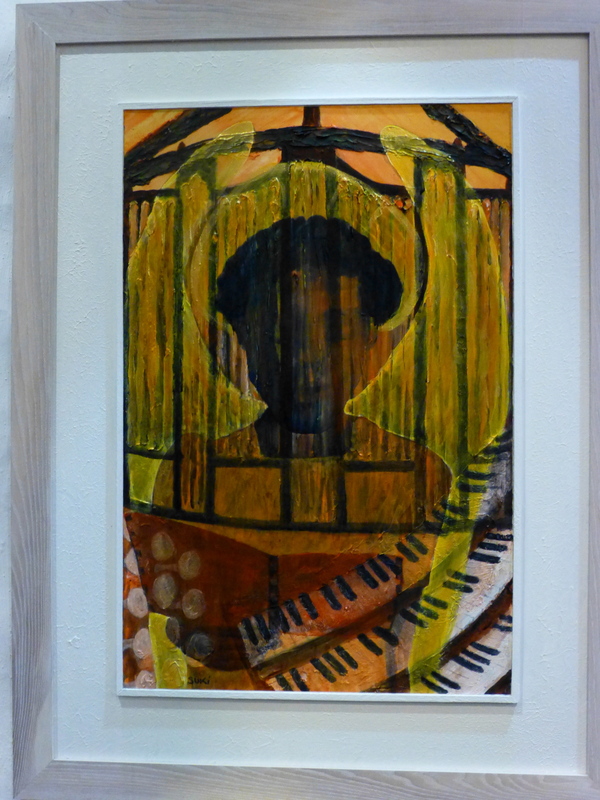 The resulting art works and poems were exhibited in St. Oswald’s between 27th September and 8th October 2013. Some of the following photos were taken during the launch event, on 27th September, when the poets read their work and the artists explained how the work influenced their own creative process. The rest of the photos were taken on the last night of the exhibition, after the final poetry reading of the Wordsworth Trust summer series (Roger McGough). 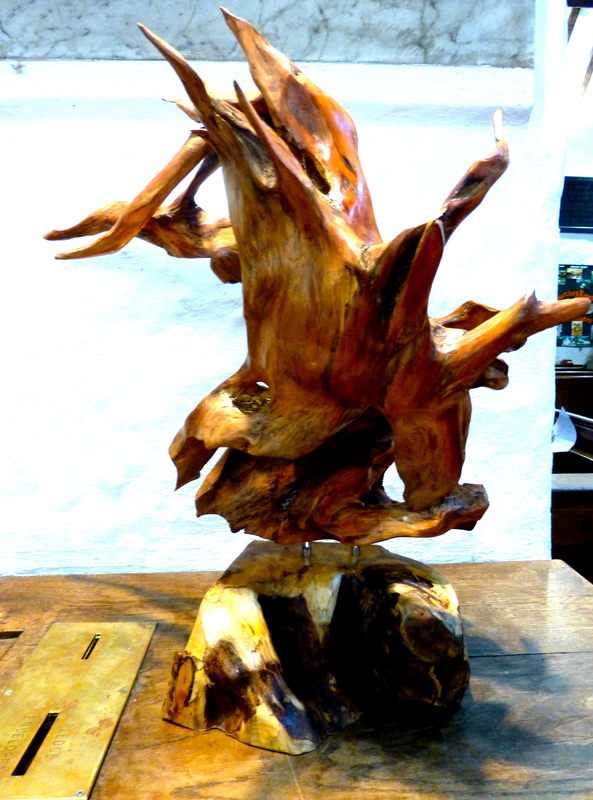 This meant I missed getting decent pictures of a few of the pieces which had sold during the week. 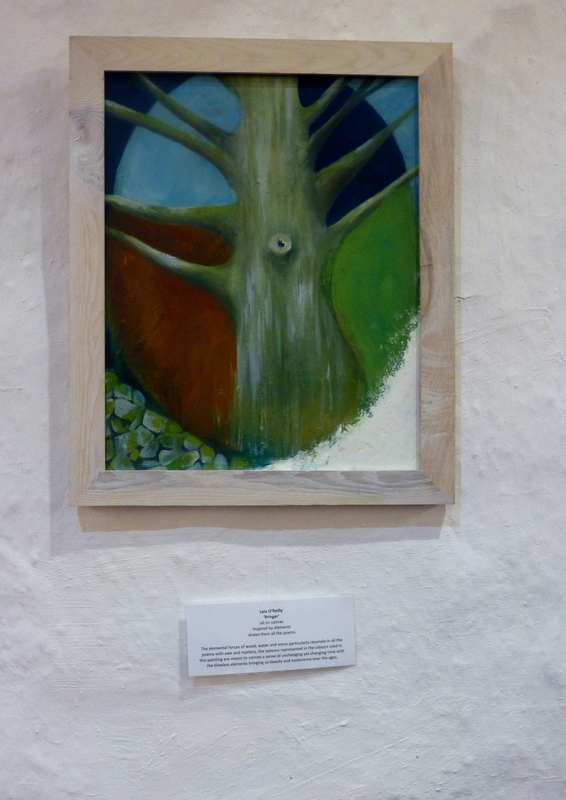 Several of the artists responded to more than one of the poems, which made for a really rich exhibition, with incredibly various visual interpretations of the poems. The general feeling amongst the poets was amazement at the range and complexity of the artistic responses. The pieces articulate sensitive critical readings of the poems. It’s always fascinating to see what other people see in your work, but to have it actualised in such arresting ways was quite astounding. 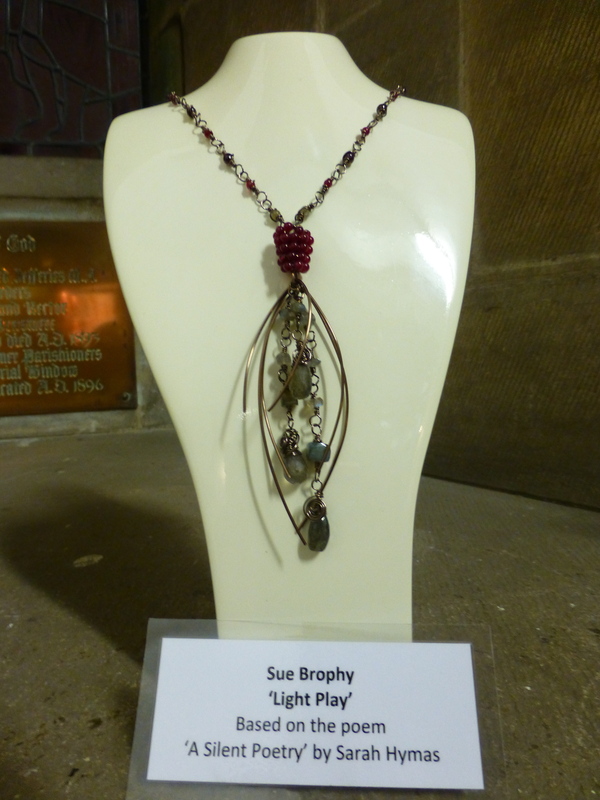 I was particularly fascinated by Sue Brophy’s interpretations of Sarah Hymas’ poem ‘A Silent Poetry’ (with light-reflecting laboradites) and my poems ‘Illustrations of Grasmere Church’ and ‘Waking the Well’. 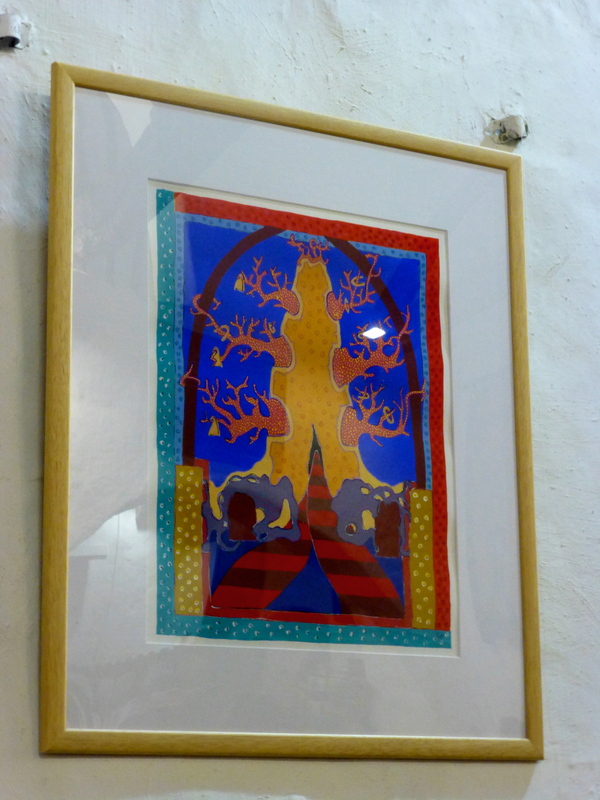 ‘I carry you with me’, takes a phrase from my poem ‘Illustrations of Grasmere Church’, which appears within the church, to make a kind of charm. 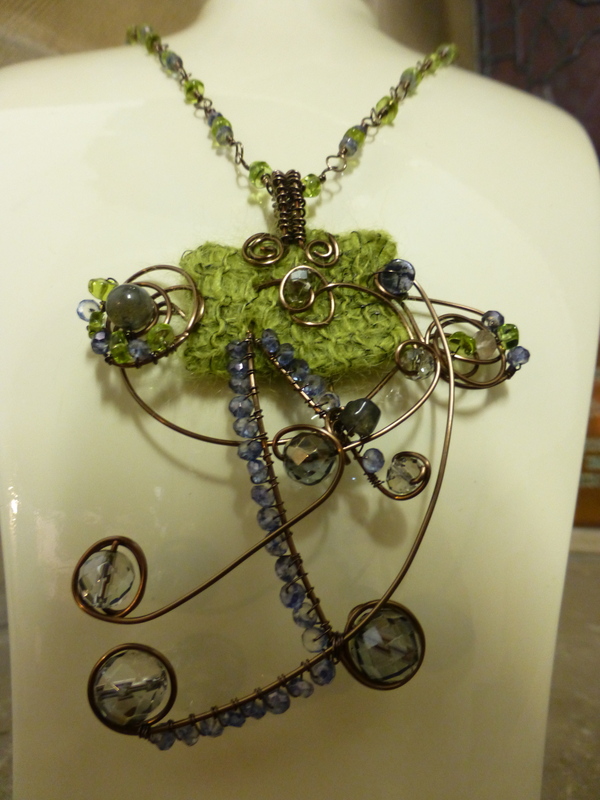 For ‘Tendrils and Spills’ based on ‘Waking the Well’, Sue wove green wool amongst peridots and iolites. It really looks like the poem. 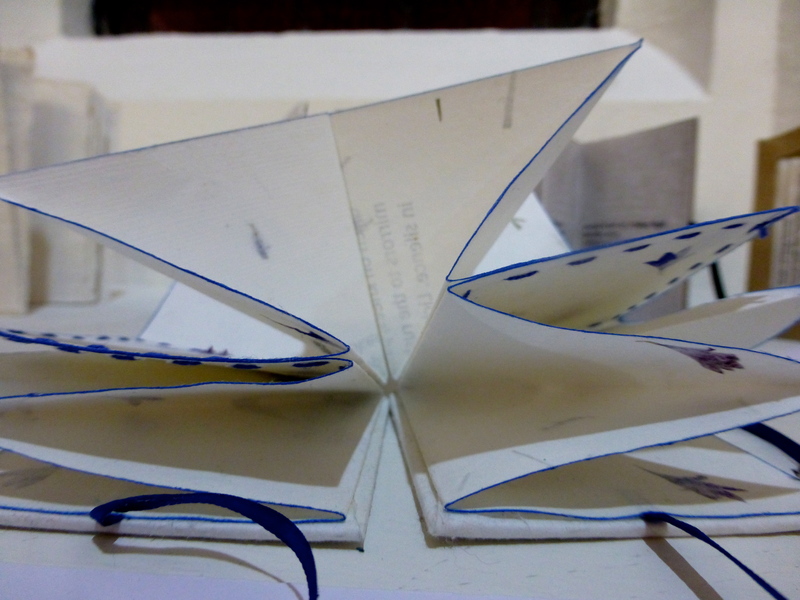 I spent a lot of time looking at the array of folded and cut paper-art she had produced; a pamphlet-like book for each of the poems. I especially like the acorn toggles on this one. And how my ‘Dreaming the Organ’ is piped out line by line. 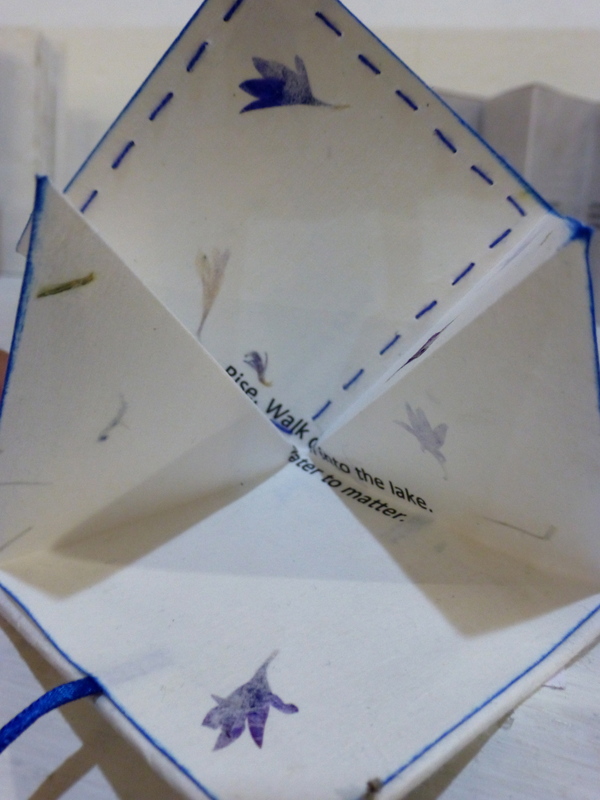 Helen Golding-Miller had also responded to the poetry by making books, including a jackdaw book, from Mark Ward’s poem. 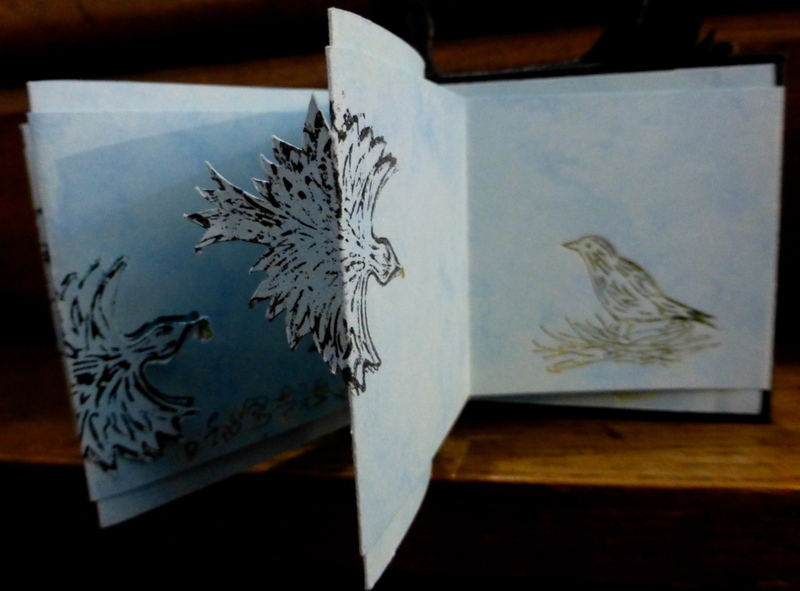 The jackdaw stamps she made to use in the book were a work of art in themselves. 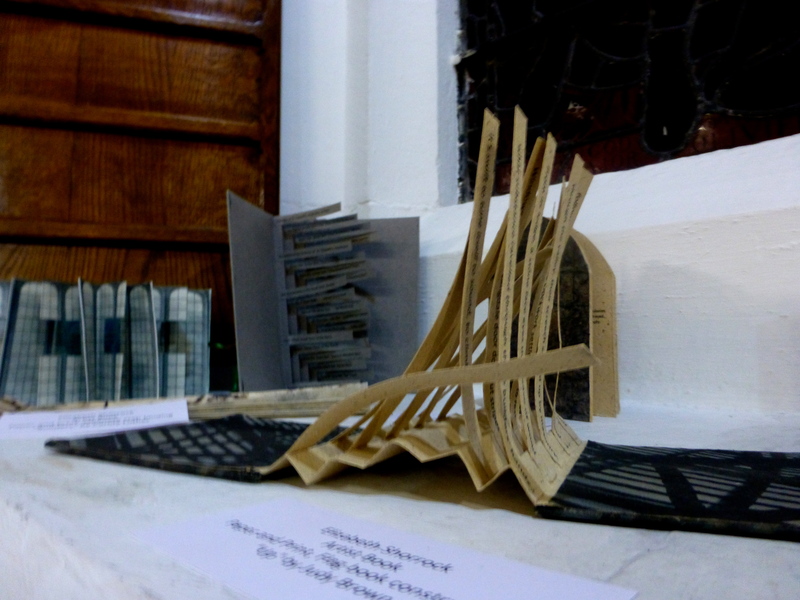 The exhibition had been thought through carefully to really use the spaces of the church to full effect. 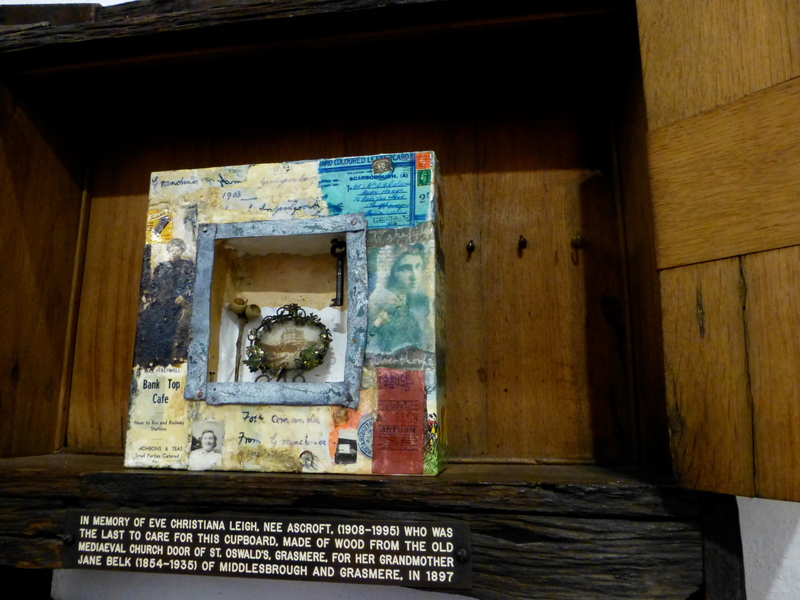 In memory of Eve Christiana Leigh, nee Ashcroft, (1908-1995) who was the last to care for this cupboard, made of wood from the old Mediaeval Church Door of St. Oswald’s, Grasmere, for her grandmother Jane Belk (1854-1935) of Middlesbrough and Grasmere, in 1897. I’m not sure exactly what ‘car[ing] for a cupboard’ might entail or why it had to stop. 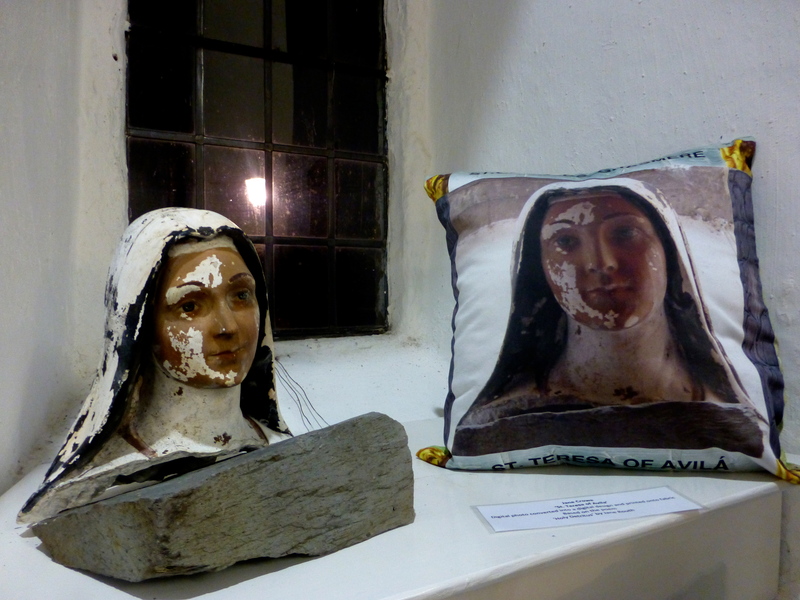 St. Teresa of Avila’s head (long story) had been moved from its normal position in the Langdale aisle, to sit next to Jane Crowe’s textile responses to Jane Routh’s poem ‘Holy Detritus’ (from which the exhibition name was taken), and some C17th pew-ends that appear in the poem. 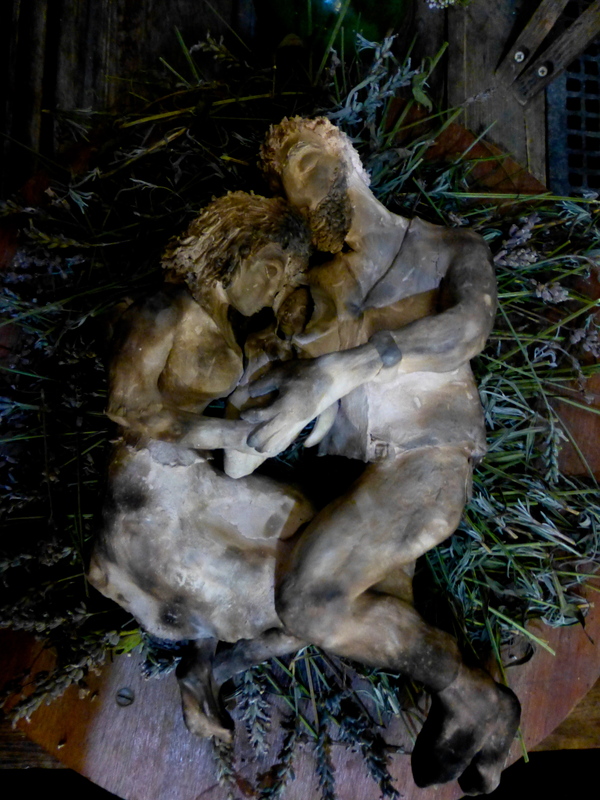 Elsewhere, fired clay figures by Clare Humphrey sprouted out of the old font, and nestled in beds of dried lavender (inspired by Kim Moore and Carola Luther’s poems, respectively). 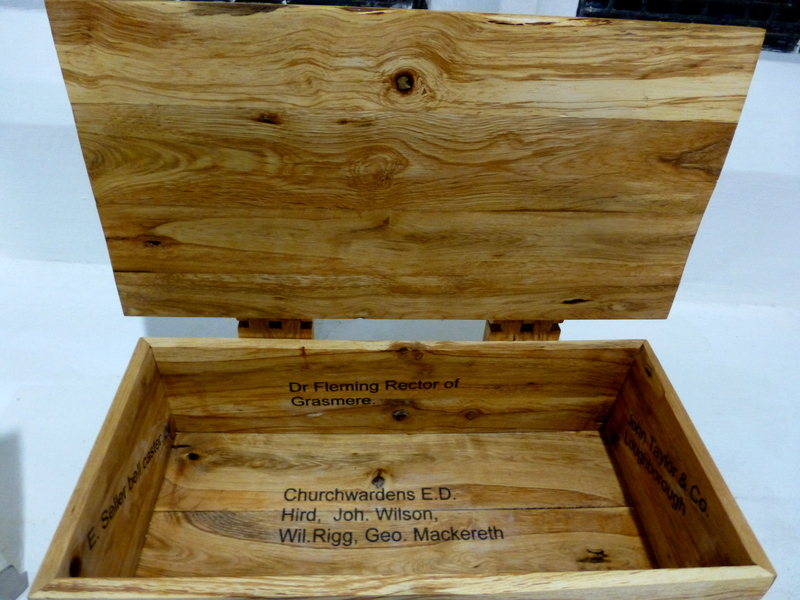 An oak box printed inside with churchwarden’s names – made from local Rydal Estate wood by Keith Shorrock, after ‘Illustrations of Grasmere Church’ – settled into one of the window recesses like a part of the church’s own paraphernalia. More woodwork, interpreting Kim Moore’s poem, sat by one of the central pillars. 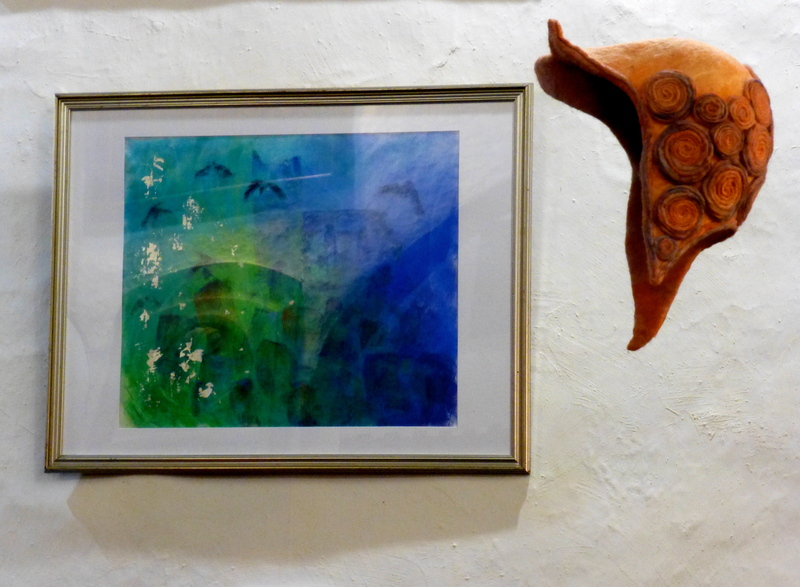 Various paintings and prints hung on the walls, and two felt hats from the ceiling. 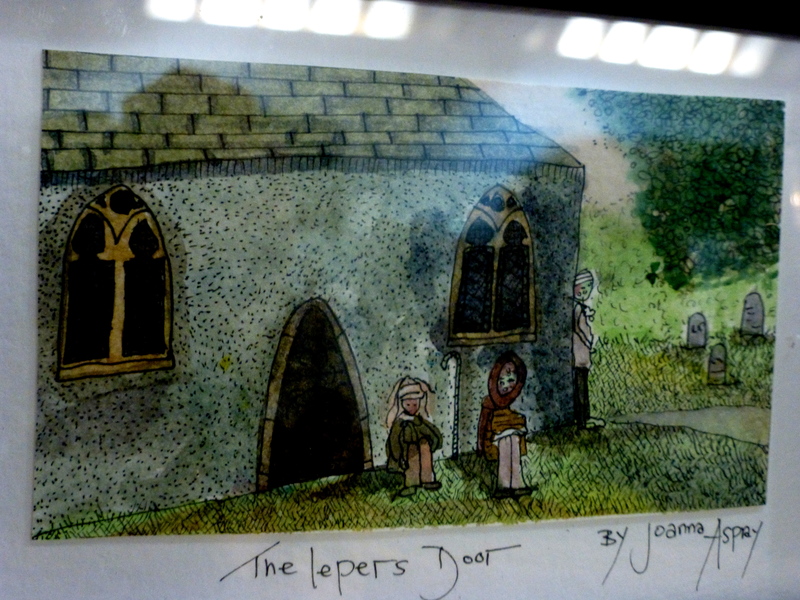 Joanna Aspray, on the other hand, did an illustration for each of the poems. 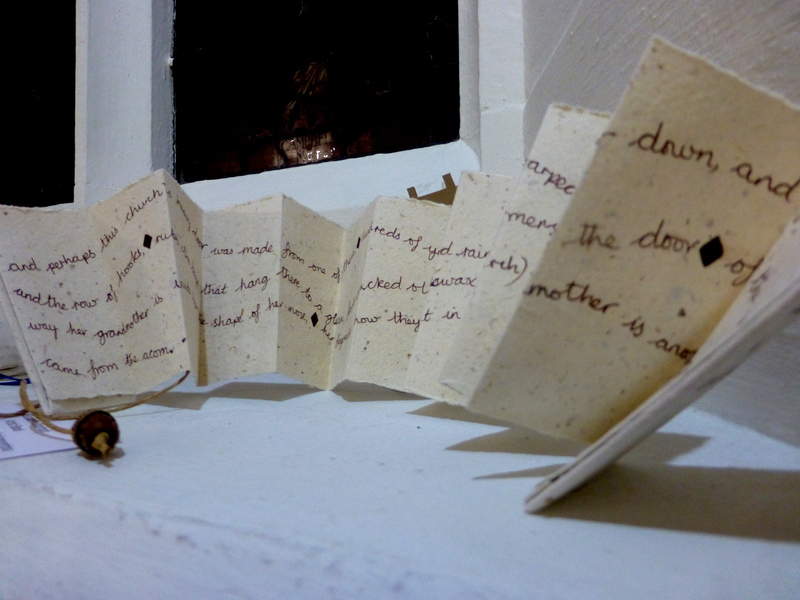 One of the pieces that most impressed upon the imagination was Amanda Hunter’s Leper’s Ring, a response to Mike Barlow’s poem on the old Leper’s Door. 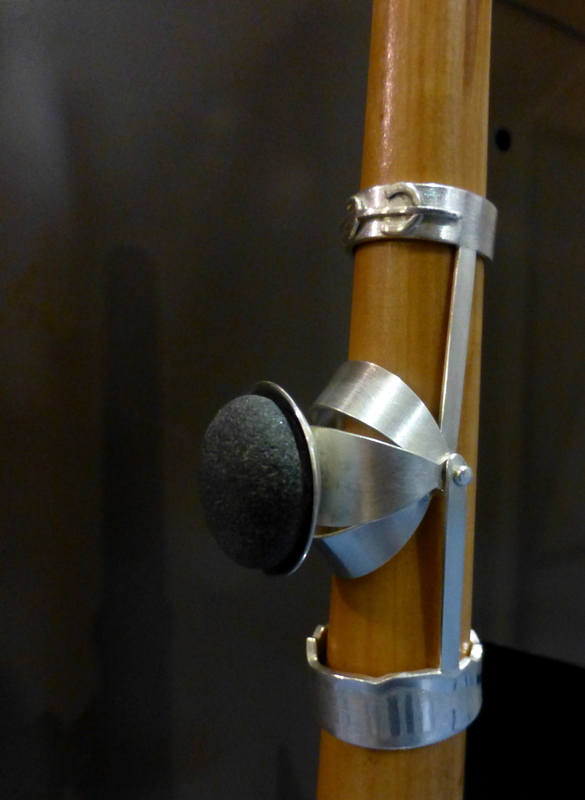 Part finger-caliper, part door-knocker, it has the look of a piece of antique medical equipment. 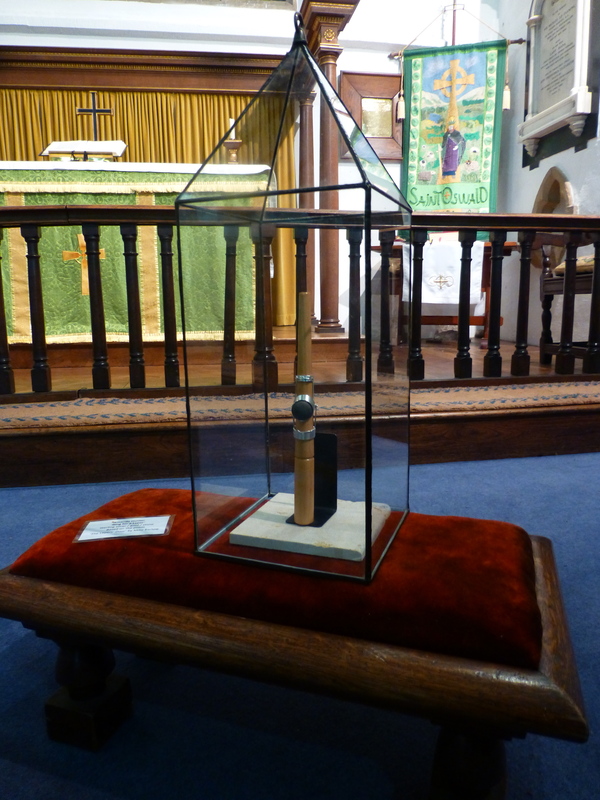 Presented in a glass case, it felt like an item from a peculiar Victorian collection. 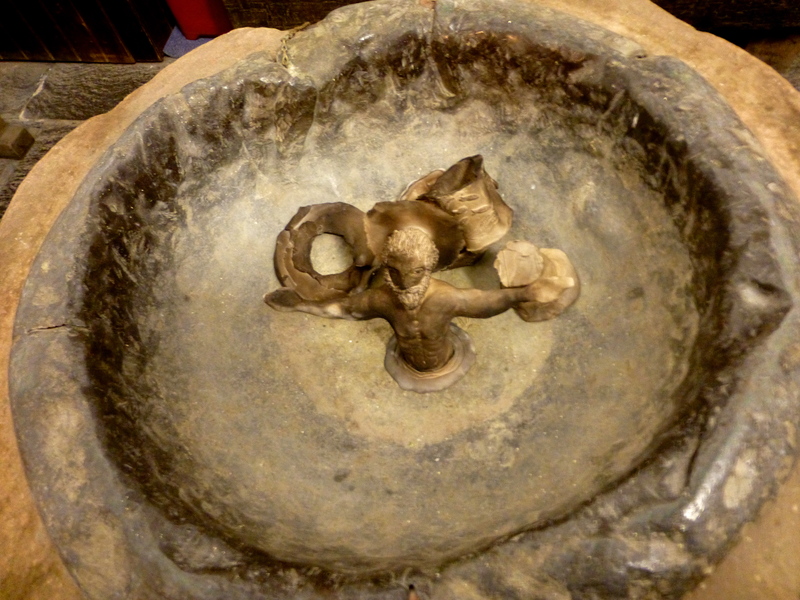 I could imagine it sitting next to the Hand of Glory in Whitby museum. Seeing the exhibition packed up and taken away, taken out of that very specific context, was rather sad. Hi Clare – glad you enjoyed both the report and the process. It was a great thing to be part of. 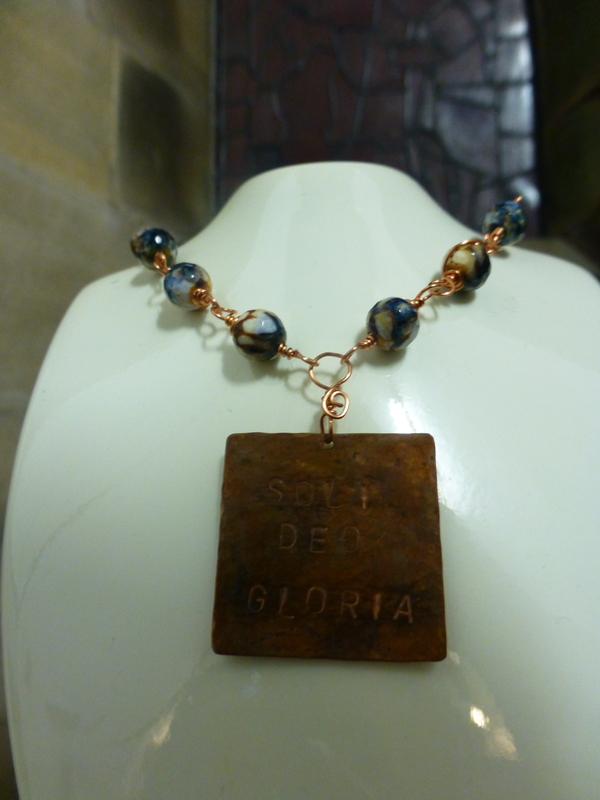 If you have a link to any other work you’d like me to add in do let me know… Polly.